You are viewing the archived healthy meal delivery page. Follow the link to view the current Healthy Meal Delivery ratings. Compare healthy meal delivery services HelloFresh, Lite n’ Easy and Youfoodz on delivery reliability, customer service, flexibility, food freshness, meal variety, taste, value for money and overall customer satisfaction. Canstar Blue research finalised in November 2017, published in November 2017. 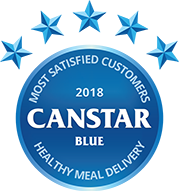 Canstar Blue’s latest review of healthy meal delivery services has seen Youfoodz cook up a storm. It earned five-star reviews from customers on its food freshness, taste, customer service, value for money and overall customer satisfaction. Youfoodz leads the way from Lite n’ Easy & HelloFresh. We all know that eating healthy is important, but when life gets busy it can be difficult to regularly prepare fresh meals – or even to keep a consistent supply of fresh ingredients in the fridge to cook with in the first place! That’s when healthy meal delivery services can come to the rescue. Ordering meals or ingredients to make them ahead of time has become increasingly popular in Australia, with a widening range of companies offering all different kinds of healthy meal options. The competition is a good thing for consumers, but which food delivery service really offers the most comprehensive range of meals, the tastiest dishes and the best bang for your buck? To offer some guidance, we’ve surveyed hundreds of paying customers across the country, asking them to rate the service they most recently used across all the important factors, including delivery reliability, customer service and food freshness. Relative newcomer Youfoodz, based in Brisbane, has emerged at the top of the ratings table this year, scoring five-star reviews from customers on food freshness, taste, customer service, value for money and overall satisfaction. It also earned a respectable four stars for its variety of meals, flexibility and delivery reliability. Lite n’ Easy achieved four stars overall, but excelled with regards to its meal variety, flexibility, delivery reliability and value for money. HelloFresh scored three stars overall, with a mix of three and four stars across the board. Should I use a healthy meal delivery service? There are plenty of reasons why people enjoy using healthy meal delivery services, whether it’s for the convenience, to lose weight, or for an easy way to try new foods. On average, our survey respondents spend $221.51 per month on healthy meal deliveries. While they’re certainly convenient, they’re probably not as cheap as buying and cooking similar ingredients yourself at home, which is the trade-off you have to make for fast but healthy food. Eight out of ten respondents to the survey (81%) said they would use such food delivery services more if they were cheaper, while more than half (53%) only tried it in the first place because they had a discount or promotional offer. Clearly, price is a big factor when choosing a healthy meal delivery service. Despite this, survey respondents had an overall favourable view of healthy meal deliveries – 80% say they would recommend them to a friend. If you’re looking to foray into fresh food, delivered to your door with minimal fuss, we’re here to help you find the right service for you. With an emphasis on time-saving, Youfoodz offers healthy meals for busy people. Meals, snacks, juices and protein powders are all available to purchase individually or as part of meal plans, with new menu options said to be added every few weeks. Meals are packed using ‘Modified Atmosphere Packaging’, a process that removes oxygen to keep the contents fresher for longer. Prices are relatively uniform, with meals generally priced at $9.95 each, while snacks and juices are generally $4.95 each. There are no contracts with Youfoodz, so you can order at your whim. The only requirements are that each order comes to a minimum spend of $69 (i.e. 7 meals). Delivery is free in most areas, with a $10 fee for some regional coastal areas and $20 for Perth deliveries. If you’re not home, orders are dropped off in a polystyrene esky with ice packs to keep food safely cool for up to 6-8 hours. For those too disorganised to order ahead, Youfoodz meals are also stocked by over 1,600 supermarkets, convenience stores, gyms and cafes across the country. A long-running meal delivery company with a focus on weight loss and weight management, as well as convenience and time-saving, Lite n’ Easy services most metro and suburban areas of Australia. Delivery is free within what it calls ‘standard’ zones, but fees will apply for some more remote areas. There’s also no subscription requirement – you can simply order as you go, or sign up for regular deliveries which can be cancelled with no charge until the day before delivery. Lite n’ Easy meals are pre-packaged into single servings that are either ready to eat straight away or just require heating in the oven or microwave. Meals are designed to fit into one of three calorie plans (with a total daily limit of 1200, 1500 or 1800 calories), which you can follow yourself using a combination of Lite n’ Easy products and other foods such as extra vegetables and fresh fruit. All dinners arrive frozen, while breakfasts, lunches and other menu items are a combination of fresh and frozen products. Prices range from $6.85 to $12.80 per meal, depending on the type of pack you choose. Lite n’ Easy also offers other food items such as snacks, soups and desserts that are priced from $2.25 to $6.50 per serve. The menu changes regularly, but with over 45 dinners alone to choose from you’re unlikely to get bored. Lite n’ Easy’s menu cannot accommodate some special dietary requirements, including allergies and vegetarianism. If you don’t have any special requirements though, it has a decent-sized menu which changes seasonally. Unlike the other meal delivery services in this year’s ratings, HelloFresh doesn’t provide pre-packaged meals. Instead, it’s a box of exactly the right ingredients to prepare fresh meals yourself. While it isn’t as convenient as fully pre-prepared meals, HelloFresh is designed to take the effort out of meal planning and grocery shopping, leaving you with the most rewarding part – cooking a fresh healthy meal. The rotating weekly menu of recipes is interesting but achievable for the average home cook. In Australia the menu team is headed by Masterchef finalist Tom Rutledge. HelloFresh works as a subscription service – choose from the Classic Box, Veggie Box or Family Box meal plans, with prices starting from the equivalent of $8.75 per meal. The Classic and Veggie boxes are each available for either two or four adults, with a choice of three, four or five meals per person. The Family box feeds two adults plus two to three kids for four meals. Each box includes ingredients, recipe cards with nutritional information and gel ice packs where needed – all in a box insulted with biodegradable material. The recipes assume you already have certain food staples in your pantry (e.g. salt, pepper, soy sauce, white wine vinegar, eggs, milk), but gives notice of what items you’ll need in advance of delivery. You can pause or change your plan as you go, as well as choose the most suitable delivery day and time for you. While HelloFresh caters well to vegetarians, you’re out of luck if you have some other specific dietary requirements. However, as each ingredient is separately packaged, you could just not use any that are a problem for you and find a substitute if necessary. This may not be a viable option for those with ethical or religious oppositions to certain foods though. The other drawback is that, if you’re not diligent and use your ingredients quickly, they may go bad and end up being a waste of money. While the three major brands received the sufficient sample size to be included in our latest review, it’s worth keeping in mind that there are several other companies all offering similar meal delivery services, from international brands to small local businesses. Some specialise in particular food types while others simply have different offerings to give you plenty of choice when looking for a more convenient way to eat healthy. Five Point Four offers plans for low carb, muscle gain and active diets, as well as vegan meals. Caveman Kitchen specialises in paleo meals, with all products free from gluten, lactose, and grains. Marley Spoon is another ingredients and recipe delivery service, where you can choose from a selection of recipes each week. Weight Watchers has moved into the fresh ingredients delivery service, with its WW Freshbox subscription offering boxes of fresh ingredients to prepare Weight Watchers designed recipes. Thomas Farms Kitchen delivers fresh ingredients to cook with, but offers two options – choose your own recipes from the menu, or just choose a meal plan and be surprised. This service offers some quite gourmet options! Fresh Meals 2 U delivers fresh, packaged breakfast, lunch, dinner and snacks ranging from simple fresh veggies to elaborate dishes that would be a bit of a hassle to prepare yourself. Choose your plan based on daily calorie limits. As you can see, there are a lot of different services to choose from depending on your dietary needs, budget, and whether you want ready meals or easy home cooking. Which healthy meal delivery service should I choose? While Youfoodz and Lite n’ Easy offer fully prepared meals that need little more than a minute or two in the microwave before they’re ready to eat, HelloFresh is the IKEA of healthy meal delivery services in that some assembly is required. However, this can be a great option for those who don’t have the time to regularly plan meals and go grocery shopping for fresh ingredients, but still enjoy the experience of cooking. The most flexible option of the three is arguably Youfoodz – unlike with Lite n’ Easy and HelloFresh, you can buy any number of meals rather than being limited into sets of five or seven, or boxes to last only three to five meals. There’s still the minimum spend per order to adhere to, but you can make up the minimum with literally any combination of Youfoodz’s offerings. Vegetarians have rather limited options with Lite n’ Easy, so they may be best looking to Youfoodz or HelloFresh instead. Those with allergies might prefer the specificity of Youfoodz or Lite n’ Easy, where you can order specific meals, though there are no guarantees these are free of allergens. Alternatively, it’s far easier to omit offending ingredients with HelloFresh, and you can check the contents of the next week’s box ahead of time when the menu is published. Each healthy meal delivery service offers something slightly different, so if you find one doesn’t quite work there’s sure to be another service that matches your needs. Canstar Blue surveyed 3,000 Australian adults across a range of categories to measure and track customer satisfaction. Data was collected using Qualtrics’ online sample aggregation from ISO accredited panels. The outcomes reported are the results from customers within the survey group who have used a healthy meal delivery service in the last 6 months – in this case, 412 people.